Here's why Ibiza is still the number one clubbing destination in the world. While other destinations worldwide are slowly ramping up and European festivals increase every year, to this day no place has as many parties as Ibiza going on any given night for the entire summer. To prove this, we set ourselves a clubathon challenge: hit all the parties that happen in one day to night. Yes, we know, it was hard work, but somebody had to do it. Here's what happened. Take any random Tuesday, this past one, for example. Every club has some of the finest talent currently on the scene. We had every music style represented - including urban, EDM, electronica, guilty pleasures, techno, deep house, bass and underground beats - at myriad different venues. You could get down at smashing pool parties at Ocean Beach Ibiza and Ibiza Rocks Hotel during the day or spend the afternoon and evening on a journey of wonder at Tomorrowland's Garden of Madness at Ushuaïa before heading over to swap house music for a full house at Bongo's Bingo at Eden after dinner. After dark, all the clubs open their doors. You could go for some rolling beats in the depths of Sankeys's basement, release your urban side at SWAG Ibiza, catch the number one DJs in the world at Amnesia, Hï Ibiza, Pacha and Privilege, as well as find your niche at HEART Ibiza and Underground. Or you can hit all of them like we did. We have to admit: it was not an easy feat, but we made it through the night. Ibiza's club history goes back half a century, some would say when clubbing began. While the island is not as busy as some years, in terms of nightlife, Ibiza undoubtedly retains its title as the number one clubbing destination in the world - its heritage fueled by decades of the best electronic music and the most incredible parties. With something for everyone, we hit the road in the brand new Ibiza-Spotlight-mobile this past Tuesday. No matter your preference, your friends' preferences or whatever budget your wallet can handle, you will be spoilt for choice with parties. We tried 12 clubs in 12 hours. If it were ever needed, here's conclusive proof that Ibiza's fire is burning strong. Check out this gallery to see what went down on this momentous night. (Note: We had to leave out the boat parties for logistical reasons and arrived too late at Es Paradis). Ready, set, SHOT! Fresh-faced and ready to begin at the Ibiza Spotlight headquarters. Sunshine and smiles all around at a packed-out Kisstory at Ocean Beach Ibiza - oh, and even MK turned-up. If there's one thing Craig David knows, it's how to rock a residency. Legend. Steve modelling Ibiza Spotlight's new wheels. Italian fuel for our Lamborghini engines at Es Tancò. Extraordinary view from the tower and within the Garden of Madness at one of the island's best open-air venues. Pure holiday fun at Bongo's Bingo. Sadly Stivi didn't get lucky at Eden on this night - one day that double-ended prize will be yours, Stivi. 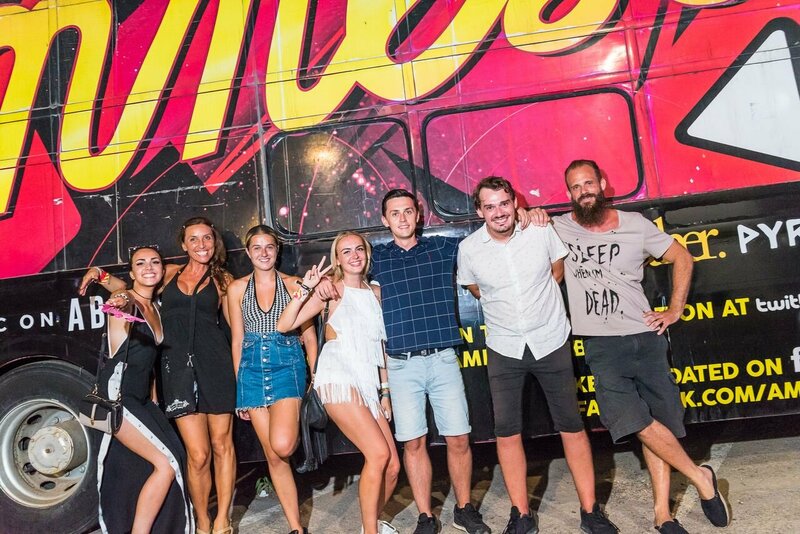 Have you really been to Amnesia if you don't get a picture by the famous bus? Wilkinson had the Club Room of Together in the palm of his hands, well, fingers, to be precise. R'n'b and urban are here to stay on the island with SWAG leading the way at MASH meUP! While not as busy, the IDOL crew rolled out some of the best music of the night. That Sankeys basement and heavy hitters were a match made in heaven. Chupito pit stop, then special guest genius deadmau5 took a rammed out Hï Ibiza to a whole new level. Heart Factory Presents The Ritual with Anané and Louie Vega was magic with Anané, Cassy and Nicole Moudaber as spellcasters. Across the road at Pacha, the evergreen Fatboy Slim brought his dynamism to town at Tuesdays On Mars. Barac rolling-up some filthy beats at Underground. The final hurdle - Adam Beyer back-to-back with Joseph Capriati at RESISTANCE - music never sounded so sweet. Daylight broke and legs gave in. 12 clubs, 12 hours. Smashed it. If you're planning a clubbing holiday, Ibiza is the one. Rivalled by no other, it's not just the superstar DJs that make the island what it is. Many other parties bring an intense energy to this small but powerful island. To this day, Ibiza's nightlife is as electrifying as ever. Pack for everything and be a part of the history that took this island to the top of the clubbing world. If you're overwhelmed by the choice, fear not. Ibiza Spotlight's Party Calendar has laid it all out for you, week-by-week, party-by-party. Be sure to follow our Facebook, Instagram, Twitter and YouTube, where you can keep up-to-date with all that is happening on the island.